The threat climate change poses to health, equity, and development has been rigorously documented. However, in an era marked by economic crisis, regional conflicts, natural disasters and growing disparities between rich and poor, the joint global actions required to address climate change have been vigorously debated – and critical decisions postponed. 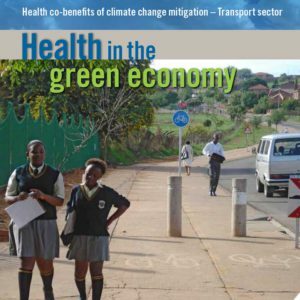 Health co-benefits of climate change mitigation (Transport Sector), part of WHO’s Health in the Green Economy series, describes how many climate change measures can be “win-wins” for people and the planet. These policies yield large, immediate public health benefits while reducing the upward trajectory of greenhouse gas emissions. Many of these policies can improve the health and equity of people in poor countries and assist developing countries in adapting to climate change that is already occurring, as evidenced by more extreme storms, flooding, drought and heatwaves. WHO’s Department of Public Health and Environment launched the Health in the Green Economy initiative in 2010 to review potential health and equity “co-benefits” of proposed climate change measures – as well as relevant risks. cycling routes can yield significant savings in travel time and expense as well as preventing disease and promoting better health.